The first time I went grocery shopping with my husband after we were married and settled into our first apartment, our shopping cart was full of contradictions. As a result of having parents who are polar opposites, we had different ideas of what a menu should consist of. I had placed bran cereal in the cart while he had chosen some sugary kids cereal I had never had. There was my whole wheat loaf of bread next to his white. His favorite meal was meatloaf, followed closely by Kraft Macaroni and Cheese, “the blue box, please.” I had never seen it in our family pantry. 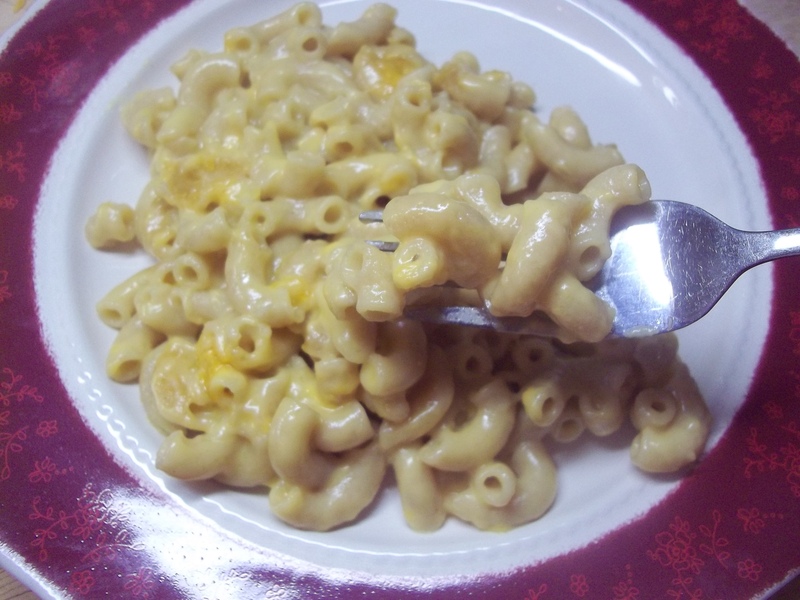 Of course I’d had mac n’ cheese and my mother made Hamburger Helper on occasion, Dad loved to make Chef Boyardee Pizza on movie nights from the box, but other than those prepackaged foods and the occasional box of Jello or pudding, these things were not a part of my every day life. I realized very quickly that we were going to have a problem. Obviously this man had no idea what healthy eating entailed and after recalling his dad saying my husband had always had, “a weak stomach”, and not long after that first grocery buying trip seeing this for myself, I thought I had a pretty good idea why. Unfortunately, a bad apple spoils the bunch. Though I had intended for my “healthy habits” to become his, I rarely ordered anything in a restaurant other than salad up until this point, and did introduce him to whole grain goodies and low fat eating. My husband, in turn, opened my eyes to some American favorites that I had never tried. The “blue box” mac ‘n’ cheese was one of them. 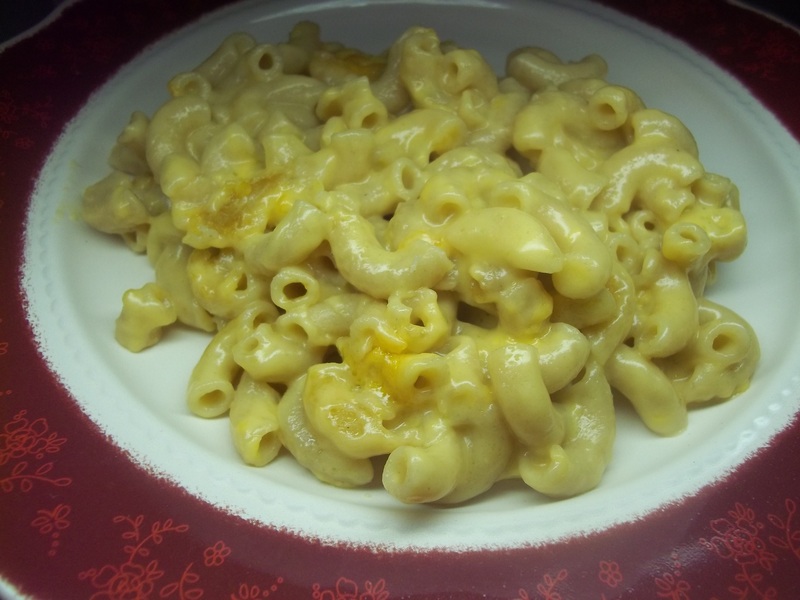 I had eaten macaroni and cheese from my school’s cafeteria plated lunches when my mom had run out of time to pack our lunch boxes. 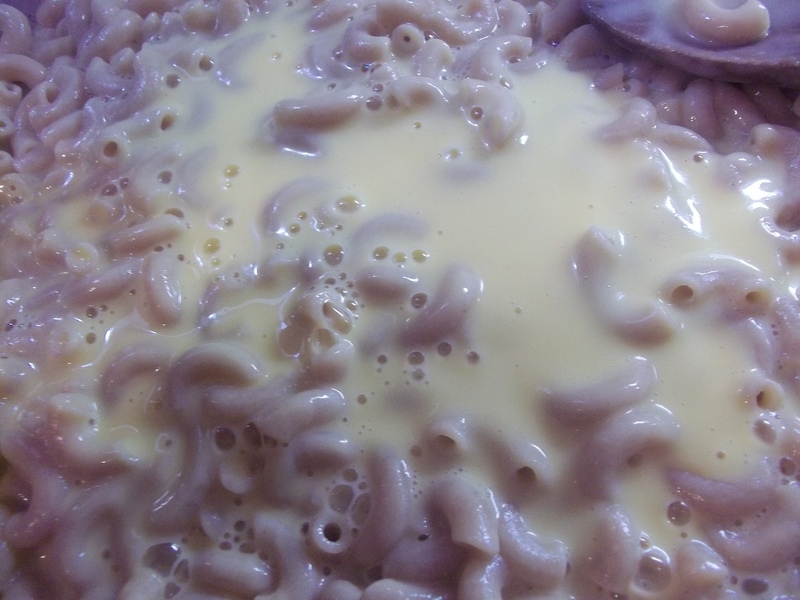 Of course there was always a CorningWare baking dish of mac ‘n’ cheese on one of the long tables at church pot luck dinners but I couldn’t recall for certain if I’d ever had the skinny noodles and yellow/orange goo that come from a box of Kraft. To celebrate our six month anniversary we went out to dinner and I ordered a steak. Steak was not uncommon on our dinner table when I was growing up, but the late eighties anti-beef, low-fat, white meat chicken only campaign had infected my mentality into believing that red meat was always to be off limits. That first bite of filet changed me forever. My husband didn’t cook much, but he could make a steak and always put a helping of prepackaged, artificially colored macaroni on the side when he cooked for me. I wasn’t totally hooked but did appreciate it in all of it’s “space food” artificiality and agreed with him that it was even better with the milk omitted and just butter added to turn the powdered “cheese” that was provided into a sticky coating for the curved noodles that swelled upon cooking…fine dining at its best. Giggle. 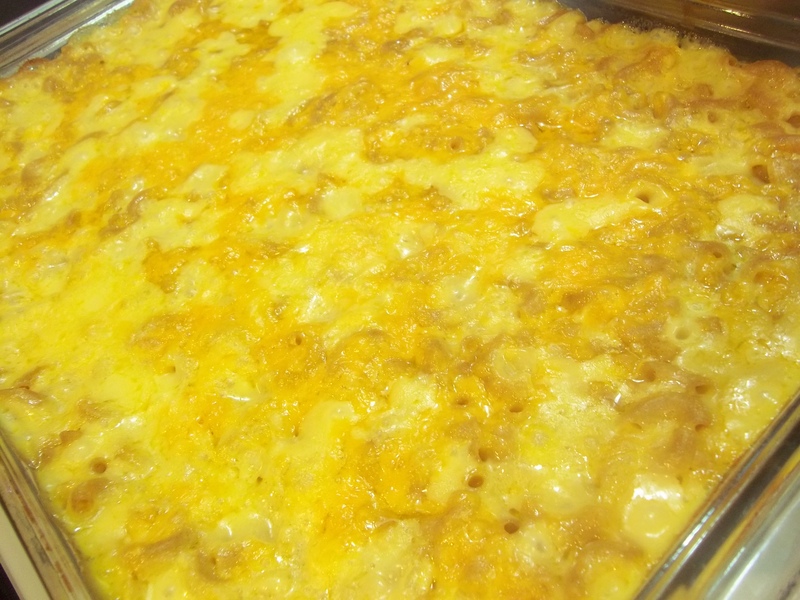 Cheddar cheese, the really sharp American kind, was on sale at one of our local stores, dramatically reduced in price, and I decided it was a good time to make a big pan of macaroni and cheese. I had the ingredients in the cart when my husband walked up and out of the blue, said that he really wanted macaroni and cheese and was going to go grab a couple of boxes. We probably haven’t had it in two or three years and it had been at least a year or two since I had made it from scratch. My jaw dropped and I showed him the ingredients I had already put in the cart to make it. He grinned at me appreciatively. The way to a man’s heart is indeed through his stomach. It’s a good thing his gallbladder (the actual and possibly hereditary cause of his “weak stomach”) has already been removed or this dish would have sent us on a midnight run to the E.R. with an attack. It’s definitely a once-in-a-while type meal in all of its gooey richness requiring hours of compensatory exercise, but worth the wait (weight). 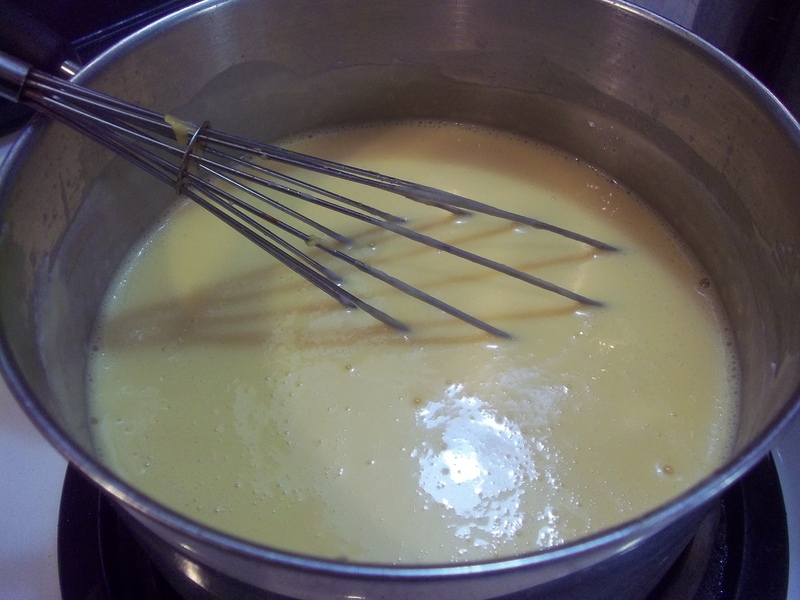 Use the butter, flour, milk, salt and pepper to make a Bechamel Sauce. How to Make Bechamel Sauce. 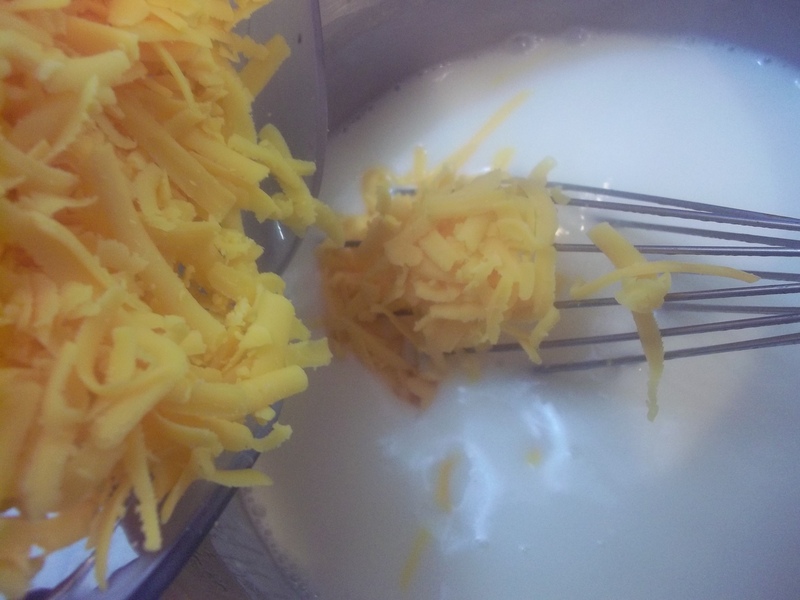 Add 5 cups of the cheddar cheese. Whisk well to combine. Mix with the cooked pasta, tossing well to coat. Grease a 13 X 9 X 2″ baking dish. 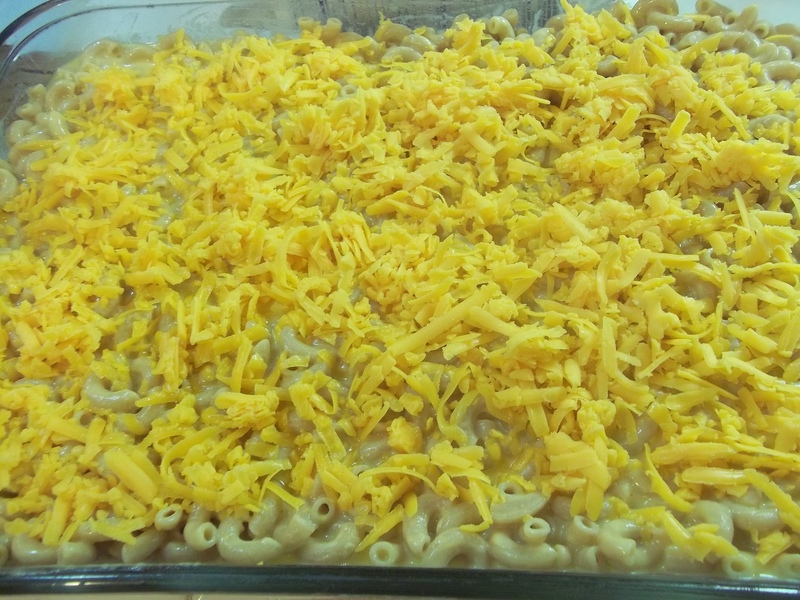 Spread the macaroni and cheese into the pan. Sprinkle on the remaining 2 cups of cheese. Bake for 30 to 45 minutes until cheese has browned and the sauce is bubbly. Yield: Enough to feed a crowd! Note: I used whole wheat pasta and couldn’t tell a bit of difference. It’s a high fat dish, but made a nice change from beans on one our vegetarian nights and there were plenty of leftovers. This is my most favourite dish in the whole wide world. Great job. Oh sorry! Must have been torture to read being lactose intolerant!